My husband had only one simple request for his recent 40th birthday. Unfortunately, I couldn’t gift him with eternal youth, so instead I opted for a good night’s sleep. As a light sleeper (I sleep like the dead), it’s fair to say that poor Pauly’s shut-eye has been momentously disrupted ever since the arrival of baby Joe. Every snuffle, snort, and baby-fart permanently recorded in the under eye circles that adorn his face. Of course, I wasn’t just going to take him to any old hotel. Oh no, I made that mistake last time. And if you remember that less-than-favourable review, you might remember that I mentioned another hotel that I had wanted to secure but had been unable due to incompatible dates. 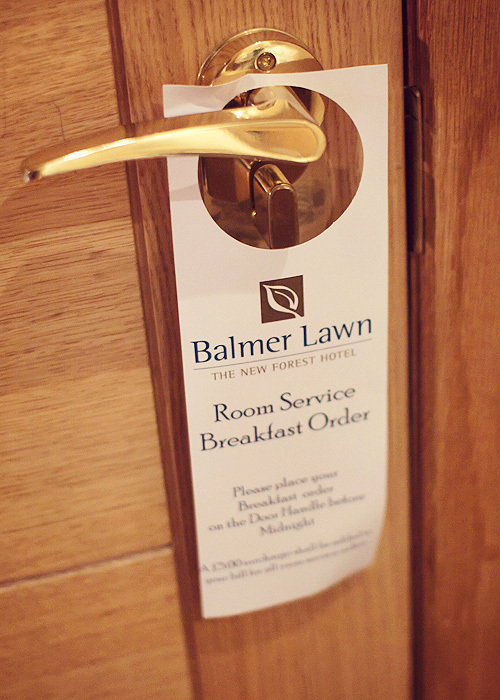 Long story short, I had no such problem this time and promptly booked us both in for an overnight stay at the Balmer Lawn Hotel in the New Forest. 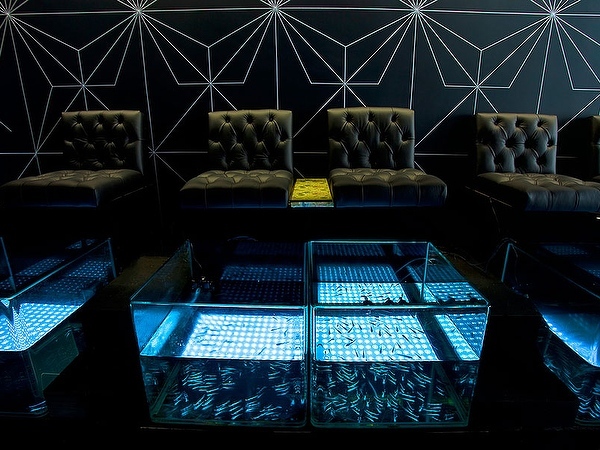 This time, I pounced upon a Travelzoo deal to procure our night of hopeful bliss. 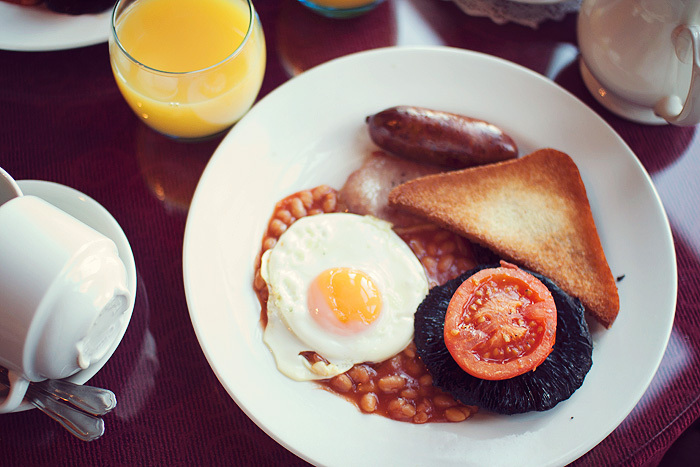 I paid for an overnight stay with breakfast, two spa treatments and a three-course meal and awaited the treat with glee. The day didn’t get off to a great start as I had to cancel the pre-booked spa treatments due to a last-minute offer of a hospital appointment that couldn’t be turned down. 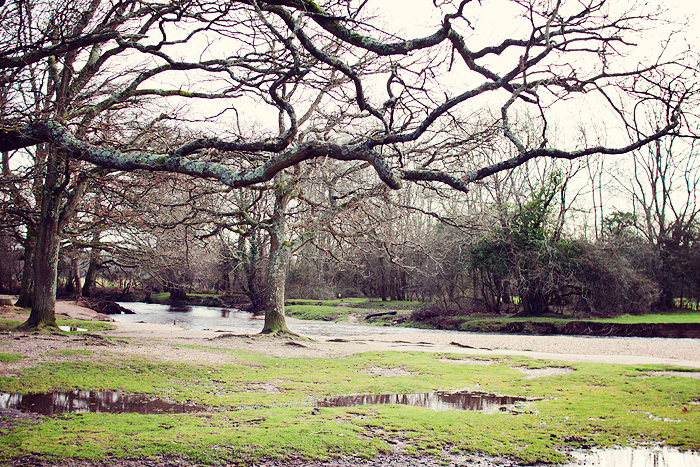 However once that was out of the way, we dashed up the M27 and into the more serene surroundings of the New Forest. 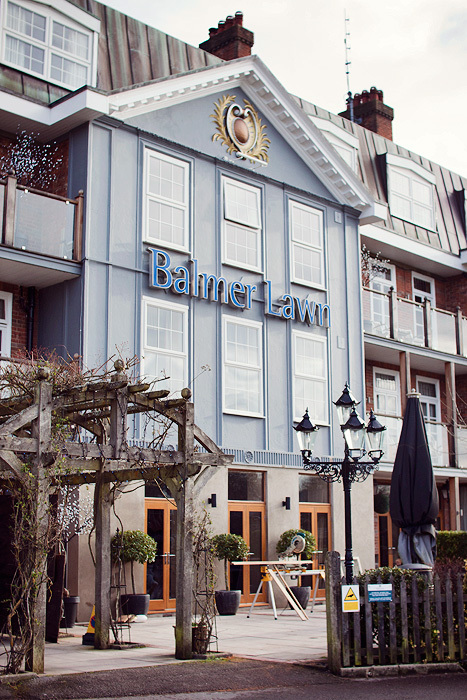 The Balmer Lawn is a hotel that I must have driven past a thousand times, I think that’s why I’ve wanted to stay for so long… the old hunting lodge has an imposing charm, set alone in splendid surroundings and I’ve always wondered what it’s like inside. Sadly, I didn’t get to experience its full charms as the hotel was slap-bang in the middle of refurbishment works when we arrived and the main lounge area, with its roaring open fire, was sadly sealed off behind sheets and boards! It couldn’t be helped though, and despite our room being fairly close to the hub of the work, we weren’t disturbed by any noise during sleeping hours. I look forward to seeing the result of the work in the future. We arrived a little earlier than I’d anticipated but it was no problem at all for the receptionist who took it in her stride and cheerfully checked us in early. 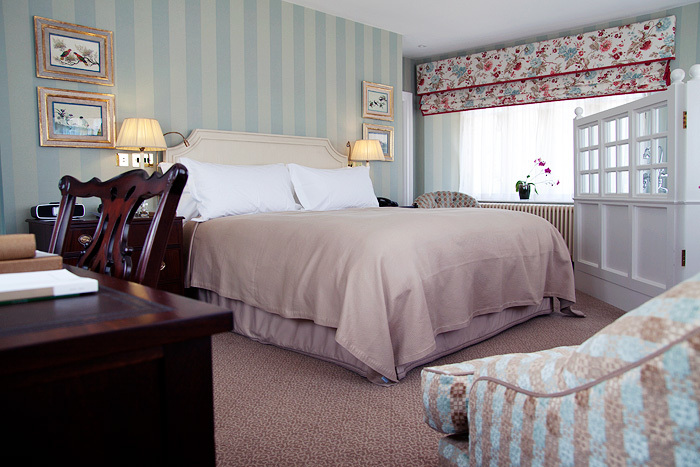 I should point out at this point that The Balmer Lawn website has the rather nifty “Look Before You Book” feature which offers plentiful photos of all the rooms available! We’d only paid for a standard room as part of the deal but the hotel has a policy of upgrading all guests whenever possible, so we ended up with a lovely four poster, superior room with forest views. Room 7, infact… take a look for yourself. 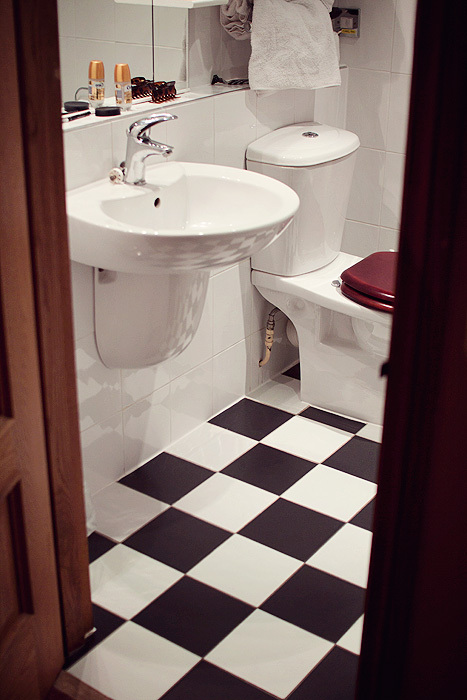 It was spacious and included everything you’d need for a comfortable overnight stay. 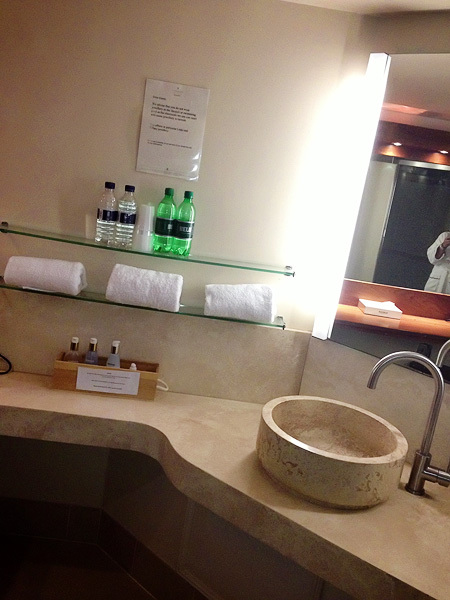 Once settled in the room, we decided to make best use of our child-free time by checking out the leisure facilities. 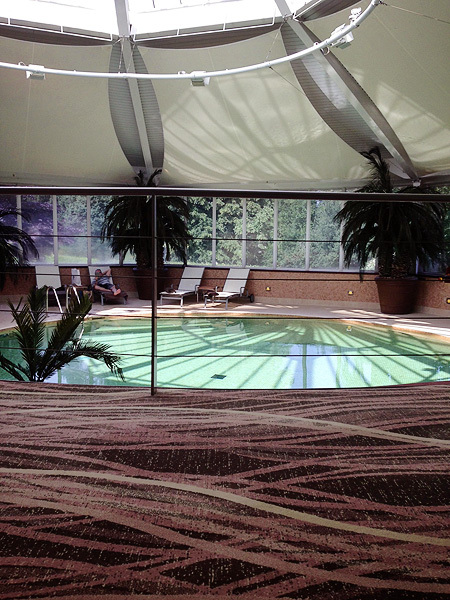 As previously mentioned, we had to forfeit our spa treatments (through no fault of the hotel) but we weren’t going to let it spoil our fun and headed straight downstairs to the pool area which was blissfully deserted. The jacuzzi was heavenly, and I parked myself in its hot, bubbling waters, deciding there and then that I was going to exercise squatters rights until at least May. I may well have followed through with my dastardly plan had I not realised that it was almost dinner time, and if there’s one thing that can get my backside moving, it’s the promise of food. Slipping back to our room, I took the opportunity to catch up on some TV and refresh my makeup before heading down to the dining room where our attentive (but not too attentive) waiter was ready to talk us through the menu. 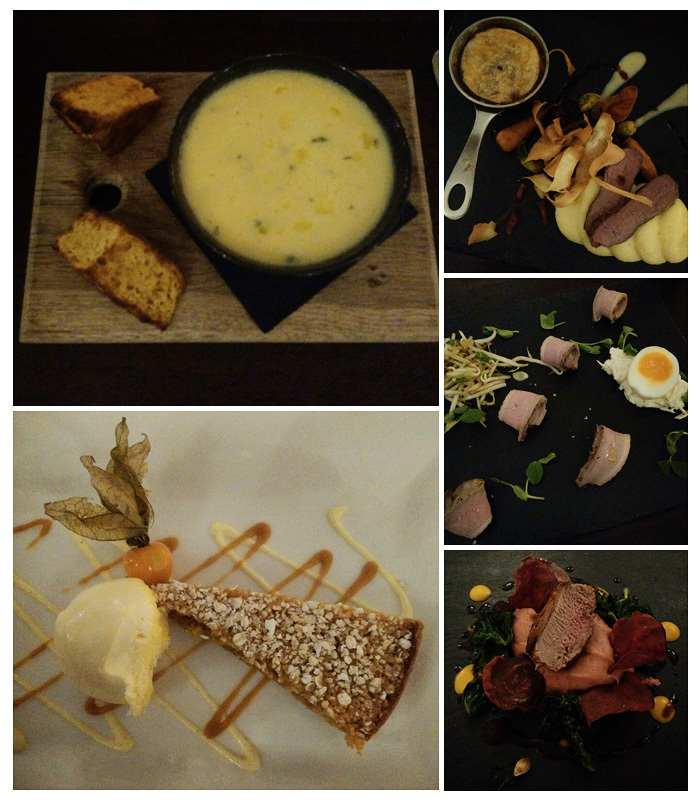 Sadly, the dining room was too dark to do the food much justice in my photos but from a sweetcorn chowder with cornbread to duck and soft boiled egg for starters, a venison and kale main to a trio of beef with vegetable crisps, we both completed the delicious proceedings with a treacle tart. 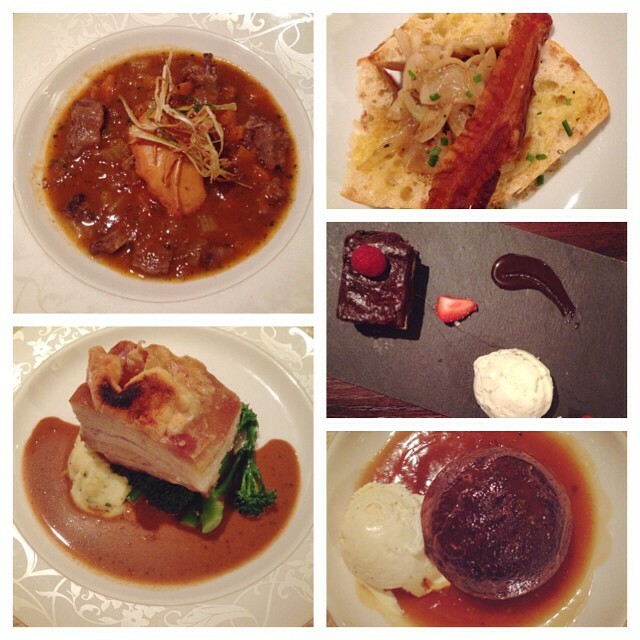 The food couldn’t be faulted on both presentation and taste, nouvelle cuisine done beautifully, but we left the table with room for a little more and thankful for the full three courses. 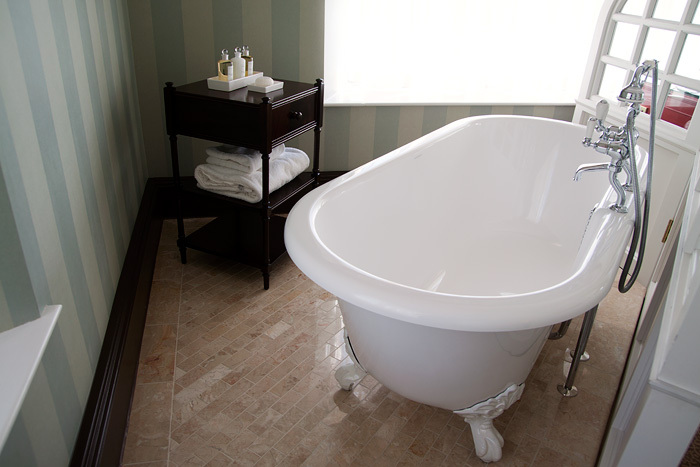 There was just enough time for a relaxing soak in the tub before we made our selections for an in-room breakfast order (£5 tray charge, well worth it) and retired for the night. The bed was extremely comfortable but I must admit that the best bit of all was the blissful silence and completely undisturbed night of sleep that we both cherished. Waking the next morning, we enjoyed a full English breakfast sat at the table in our room, overlooking the beauty of the local surroundings before taking full advantage of a late 2pm check out by taking our lazy selves straight back to bed to stock up on some more zzzzzz’s before the return to reality. 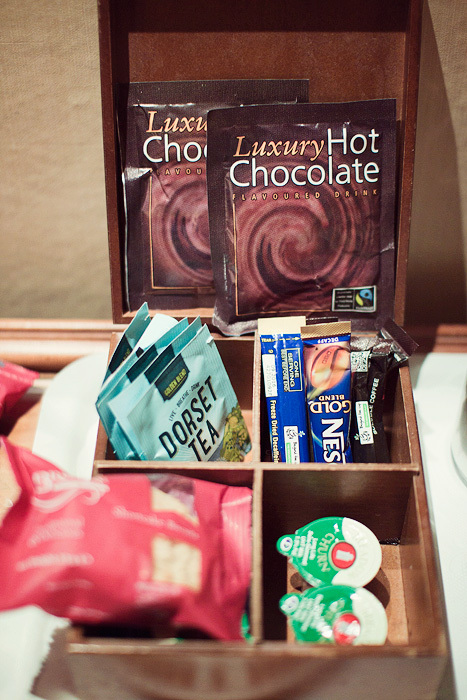 When we booked our night away, we were in desperate need of a recharge, both physically and emotionally. The kindness of the staff throughout the hotel is what shone through, nothing felt like too much trouble and everyone we passed greeted us with a warm smile and a friendly “hello”. The people who work at this establishment should be treasured because they helped facilitate the R&R that we so desired, expertly. Sadly, that was back in early January and we’re already feeling the itch for another recharge! In line with my usual state of perma-disorganisation, I’d left things quite late when I decided to book a night away for mine and Mr. L’s 10th wedding anniversary. It felt like such a frivolous thing to do, I wasn’t really sure whether we should be doing it at all, given our current state of finance (we’re saving for a deposit) and the fact that Joe is only 20-weeks old. But when my cousin offered to have Joe for the night, my resolve was tipped over the edge and I began to frantically google for something that would give us the little treat we felt that we wholeheartedly deserved! Unfortunately, our anniversary coincided with the Southampton Boat Show, which sees thousands of visitors descend upon Hampshire. Hotel rooms were at a premium. 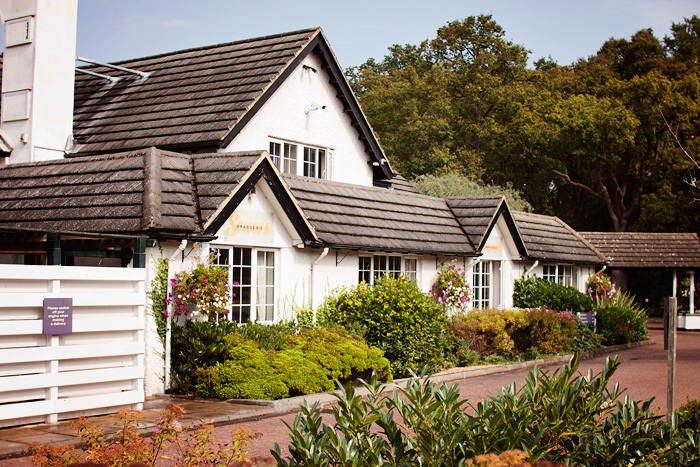 The deal I *really* wanted to go for, which was a Balmer Lawn break in the New Forest from Travelzoo, wasn’t available for booking on the date we needed! 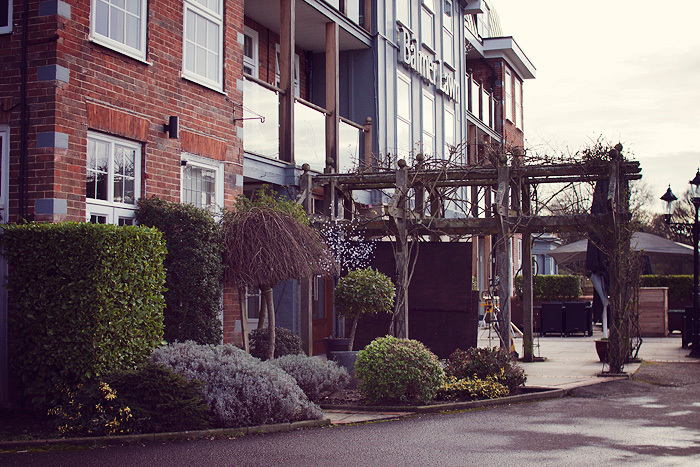 In the end, I found something that looked very reasonable on Amazon Local, an overnighter at the Basingstoke Country Hotel which included a meal and a late checkout for £109, good value no? Reading the reviews on Tripadvisor, people suggested that it was worth upgrading to a better room, so I gave them a ring and asked to upgrade. I happily paid the extra to upgrade to one of their top rooms, a deluxe double. I also enquired about the treatment menu at the spa and promptly booked two massages for us over the phone. All at additional costs. Mr. L was a bit of a reluctant spa-goer, having never had a massage before but I was excited to introduce him to the experience, and hoped it would be a good one! Upon arrival, we checked in and were given directions to our room, which we promptly headed for as we didn’t have long before we were due to go for our spa treatments. The deluxe room was large but sparse, with a large bed and a flat screen TV. However, the furnishings are quite dated and things are looking tired. 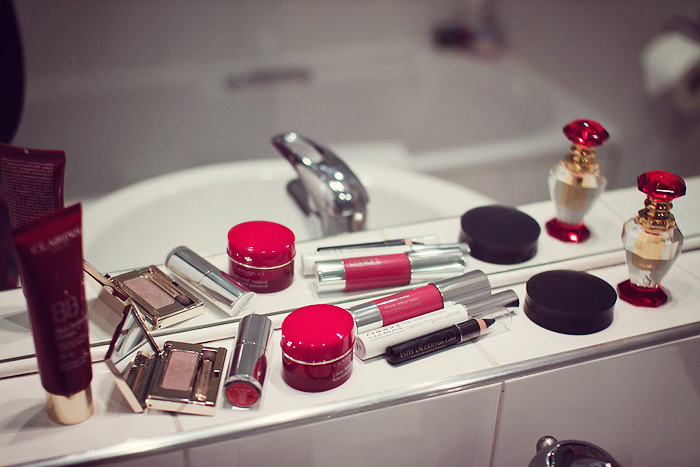 The bathroom was lovely and big but again, pretty basic. It had a bidet but to be honest, I would rather have had a clean (non foisty-smelling) shower curtain! Overall, what became apparent, very quickly indeed, was that this hotel wasn’t going to be a luxury experience. It’s aimed at the corporate market. It feels like a Premier Inn. There’s nothing wrong with a Premier Inn, heck, I spent my honeymoon in one – I’m no hotel snob… but this just wasn’t matching up to its star-rating and description. 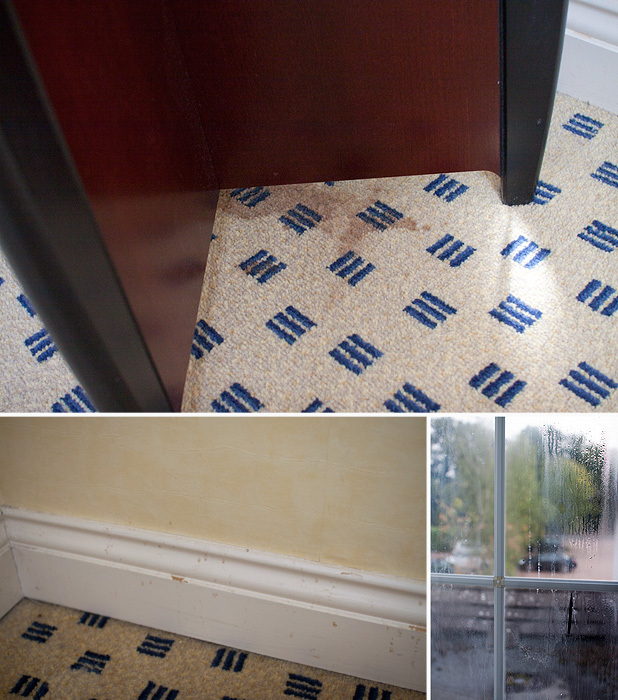 There were stains on the carpet, the skirting boards and walls could have done with a good scrub to remove the tea stains, and despite there having not been a drop of rain all day, you couldn’t see out of the window for the condensation and dirt. 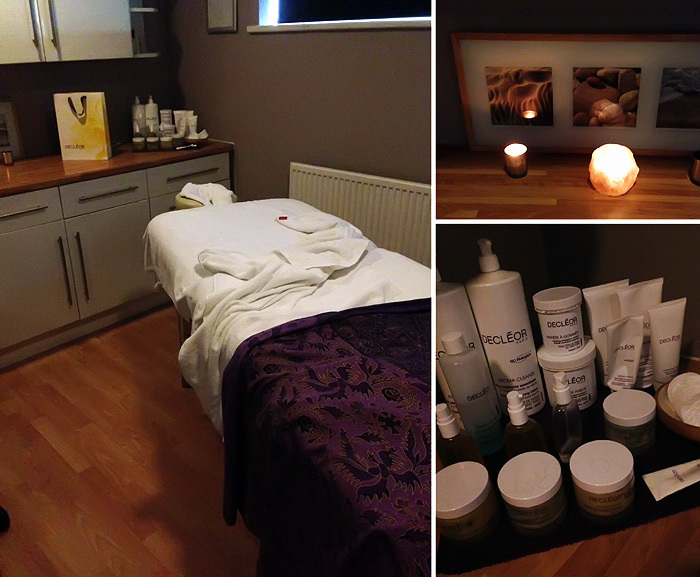 A quick peek through the leaflets on the sideboard revealed that had I not booked my spa-treatments in advance, I could have had 20% off by booking them on the day. Leaving this information for all guests to access seems a little insensitive. 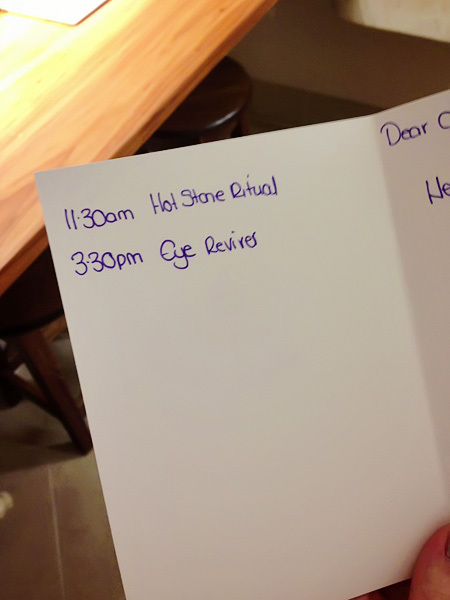 I understand the principle behind encouraging last-minute bookings in the spa but it’s irksome for a customer who has had the foresight to pre-book only a few days earlier. A better option would be to invite the receptionist to enquire upon check-in as to whether guests have pre-booked any treatments. If they have, fine… if they haven’t, perhaps at this point it would be wise to make them aware of the offer. Rather than, “Hey, here’s a discount YOU CAN’T HAVE”. 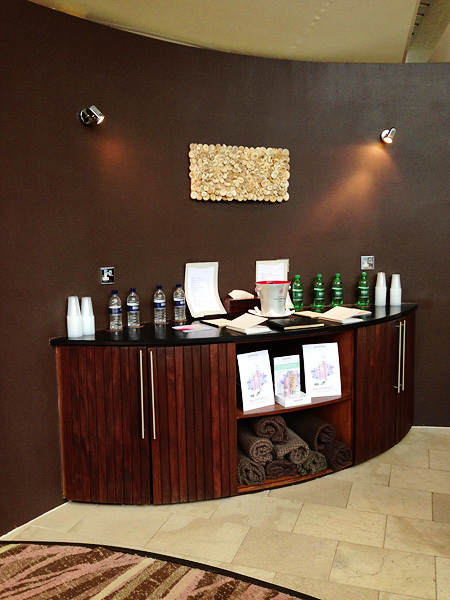 We headed down to the spa area, which involved checking-in at the reception area of the gym before being led through to the waiting room. There was a coffee machine, and we were told to help ourselves while we waited. I made two teas but then realised that there was no milk available and no-one around to ask so I had to leave them on the side. The “relaxation” area was pretty unrelaxing. Hard chairs, too-loud “musak”, and the room is in general need of repair. The wall behind the coffee area (which I think was also a reception desk), had been boarded up for hopeful future repair? Basically it just didn’t feel like a retreat. In any way, shape or form. The treatments themselves were sadly pretty insipid. I’d booked over the phone for two Hot Stone Massages but for some reason, we ended up with plain back massages instead. I’m pretty easy-going and didn’t mind this but it’s a point to note that you should double-check before arrival. During the massage, at no point was I asked what kind of pressure I liked, neither was my husband and the CD in his treatment room kept skipping throughout his massage. The oils, if scented, were undetectable to my nose and although I could feel my therapist passing over various trigger points in my back, she didn’t ask if I’d like her to work on them with a little more firmness. Again, at the time, I didn’t particularly mind because I was happy to opt for a more relaxing experience. However, the offer of a little customization would have been nice and really sets one therapist apart from another. Sadly, we walked out of the treatment rooms feeling quite indifferent about the experience. I have since assured Mr. L that not all massages are equal and that it is completely possible to experience bliss and relaxation from a good therapist! He’s unconvinced and it will take some work getting him to try again! Perhaps I’ve just been spoiled in some glorious spas over the years. Overall, it certainly wasn’t a terrible experience but I wouldn’t book again. I just don’t feel that the treatment achieved anything… in terms of easing tension, inducing relaxation, or lifting mood. It was… for want of a better word, all pretty “meh”. We headed back to the room to relax a little before dinner. 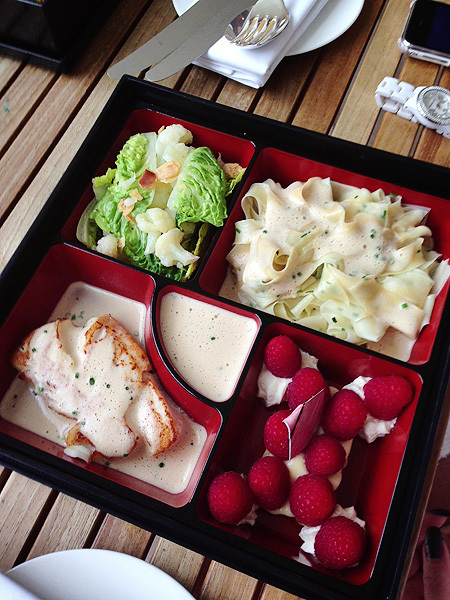 Dinner wasn’t too bad, and our server (an older lady, I forget her name) was really lovely. The fat on our belly pork hadn’t rendered very well though and we could only eat about 30% of the meat… also a little more (well-flavoured) mash wouldn’t have gone amiss! 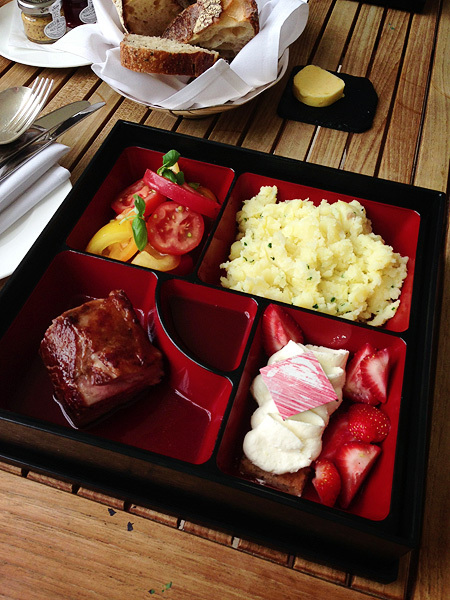 My favourite was the chicken liver starter that I enjoyed, it was really very tasty indeed. Sadly, my chocolate brownie dessert was ridiculously small, I would have been red-faced had I been serving that night, a quarter of a strawberry and a piece of brownie no bigger than a small scoop of ice-cream? Come on now! Also… lose the slates-as-plates please, my ice-cream was melting quicker than I could chase it around the bumpy surface, I reckon I lost most of it either in the ridges or off the side! We retired to bed feeling pretty dispassionate about the day but we were, at least, very much looking forward to an undisturbed, baby-free sleep! Unfortunately, the bed was really uncomfortable… both of us found the mattress to be lumpy as hell and fidgeted all night because bits (springs?) were digging in to us. At least a Premier Inn guarantees you a good nights sleep! We actually laughed over the following weekend, as we took the kids to Pontins, and got a better night’s sleep in what we had expected to be terrible beds there! Upon checking out of the Basingstoke Country Hotel, the receptionist asked if we had enjoyed our stay. In all honesty, I couldn’t even bring myself to do the very British thing of moaning about it throughout before smiling and saying “Oh, yes… lovely” to the reception staff. I just simply said: “It was alright, thank you”. And it was. But only just. If you’ve been assuming that the most magical thing about train stations is Platform 9 3/4, you’ve been looking in the wrong place. Head around the corner to St Pancras International and feast your eyes upon a thing of real beauty, the station’s new pop-up spa: Ainhoa City Spa. A spa? In a train station? Let’s face it, any kind of transit hub has the potential to be the most stressful part of our day, especially at this time of year. Whether you’re mid-journey, putting the finishing touches to your Christmas shopping, or just out on the razz with some friends – you won’t be far from some dedicated pampering to keep your wheels firmly on the rails. Ainhoa City Spa will be open throughout the festive season until the end of January, offering free express treatments to customers every day and selling Ainhoa luxury skincare products and other spa services, the first time the award-winning Spanish skincare has been available to directly purchase in the UK. DESCRIPTION: Luxurious Caviar & Gold combine with gentle Hyaluronic Acid to leave your skin feeling perfectly hydrated, renewed and lifted. DESCRIPTION: The hydrating & nourishing properties of Caviar combine with Hyaluronic Acid to gently refresh & replenish your skin, leaving it hydrated & rejuvenated. DESCRIPTION: Plant Stem Cells and Hyaluronic acid will gently hydrate, regenerate and repair your complexion. A wonderfully luxurious and rejuvenating treatment. DESCRIPTION: A luxurious mineral treatment that will drape your skin in diamonds, designed to combat premature ageing by helping to lift and smooth fine expression lines. 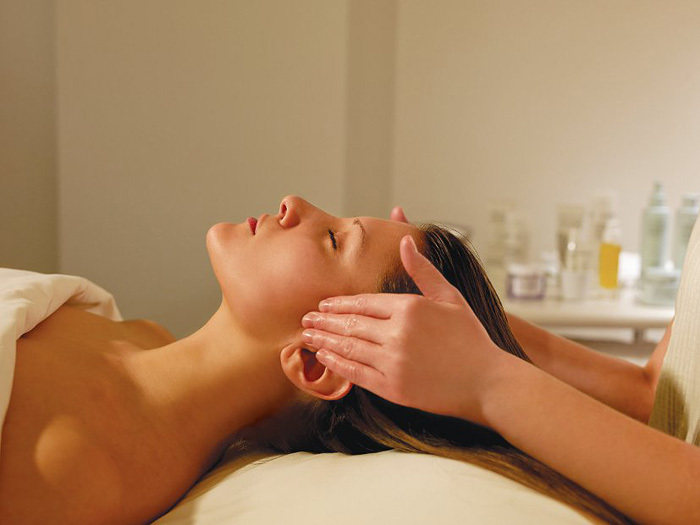 DESCRIPTION: Ease away life’s stresses and strains with this balancing and hydrating anti-oxidant facial. A perfect winter treat. 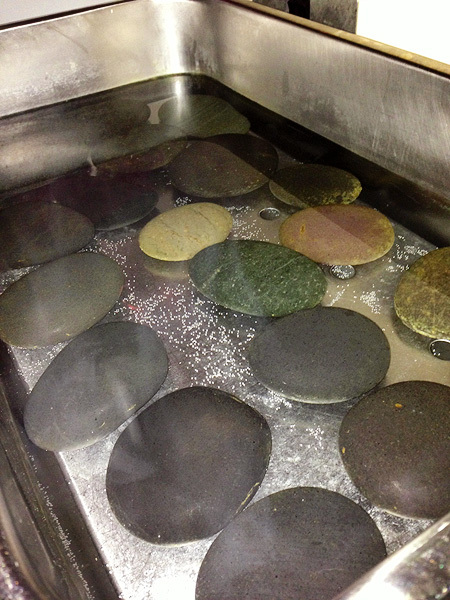 DESCRIPTION: Gently cleansing and antiseptic treatment to address excess oil production. Wonderfully balancing, leaving your skin feeling decongested yet hydrated. DESCRIPTION: Cleanse, rebalance, rehydrate. 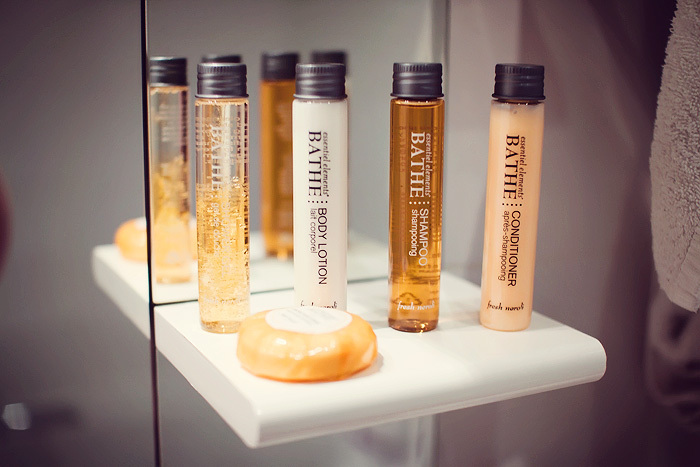 A decongesting, cleansing treatment to leave your skin feeling smooth, revitalised and protected. DESCRIPTION: Rehydrate, invigorate, protect. Reclaim your skin’s natural elasticity and ease the appearance of fine lines with this firming, anti-ageing treatment. I’d advise phoning ahead (020 7843 7683) to reserve your free express treatment, I foresee the offer becoming a little bit popular. It’s nearly Friday afternoon, which means that I’m in the mood for relaxing. Let’s just gloss over the fact that I’ve been on holiday all week ok? 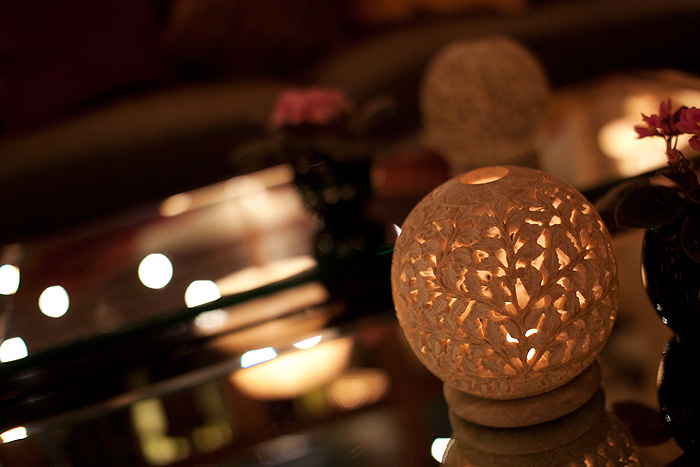 Dove Spa are currently offering a Dove Spa Drift Away Package, combining four treatments for just £39.00. 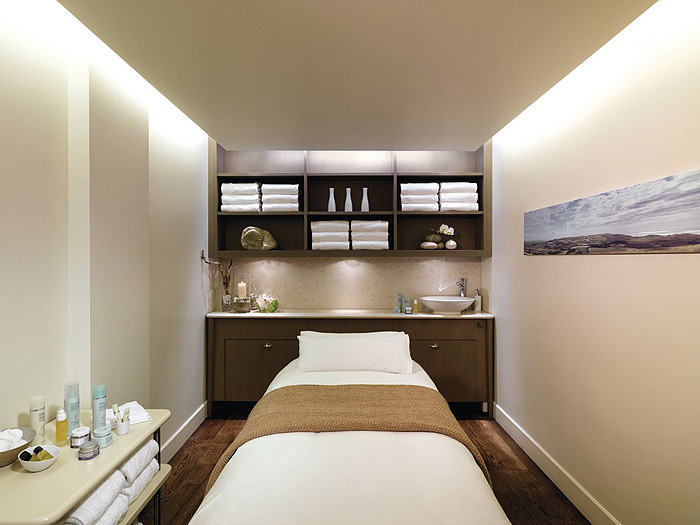 The package includes an exfoliating back scrub, a soothing back massage, a replenishing facial and your choice from either a head, foot or hand massage, all of which promises to leave you feeling completely calm and stress-free. 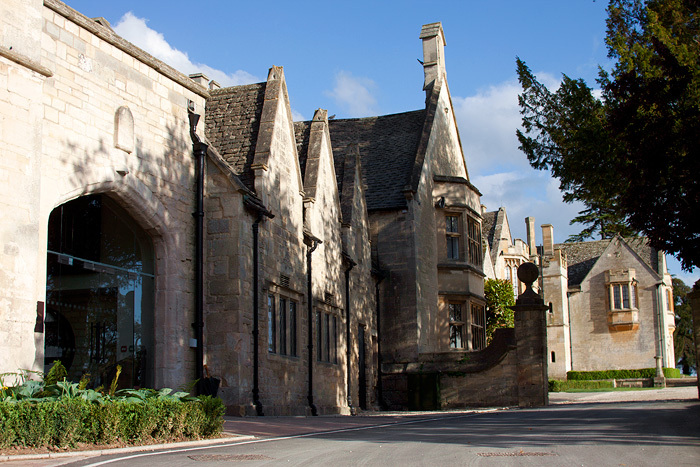 Situated on the edge of the Cotswolds and with just as much chocolate-box charm, stands Ellenborough Park, once a school for girls and now boasting 62 lavishly-decorated bedrooms within its 15th Century walls. I was invited along last week to discover the newly opened Spa, heavily influenced by the hotel’s historical connections with Lord Ellenborough, Governor General of India. The Spa is a haven of Eastern design with careful attention to detail and flourishes that bring the 19th Century colonial rule to a gentler age! 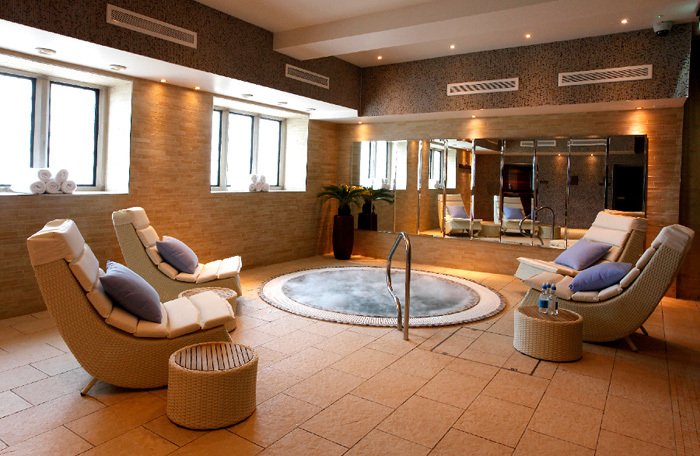 Spread over two levels, The Spa at Ellenborough Park boasts a hydrotherapy pool, sauna, steam room, sensation showers, seven individual treatment rooms and a couples treatment suite for the use of those who prefer to experience a bit of pampering a deux! 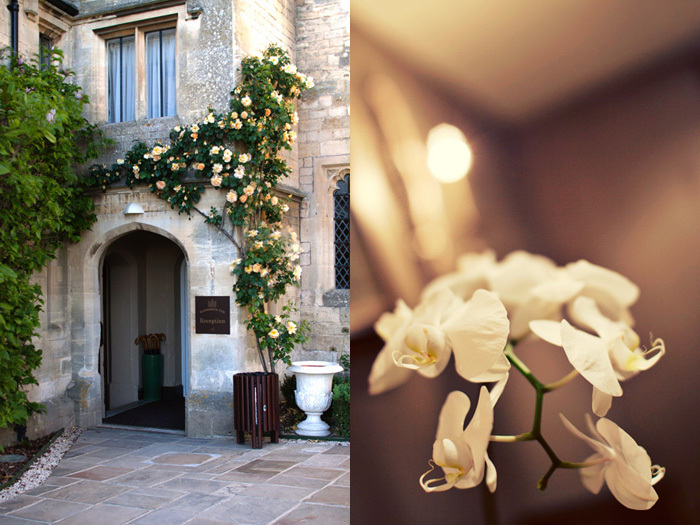 Having spent the journey to Ellenborough Park bickering with Mr. L about the best way to get there, I arrived bad-tempered and weary before throwing myself into the arms of Tessa who’d been charged with the task of introducing me to my first Aromatherapy Massage. For the first 5 minutes, I was tense and resistant to Tessa’s hands but a few reassuring strokes and a couple of deep breaths later, I’d turned to putty. She kneaded and unwound the knots across my shoulder blades without a pummel in sight! 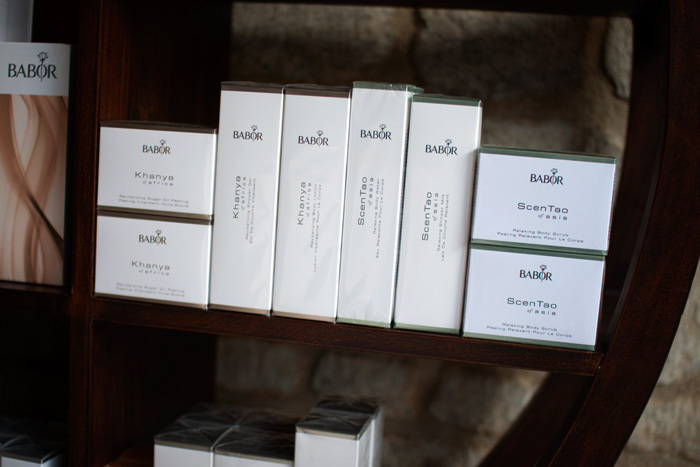 I’d chosen the Babor Energising blend of oils which scented my skin (and the room) with a tangy mix of grapefruit and petitgrain, leaving me feeling revitalised and clear-headed. My massage struck the perfect balance with firm but gentle pressure and thankfully no blathering from my therapist or elevator music to interrupt my bliss. Whilst the pressure was consistent enough to stop me from nodding off, I may have very nearly dribbled on my towel. But I won’t confirm that. If you go, I recommend spending the additional £25 to extend your experience to a full 55 minutes because it’ll take a pair of wild horses to drag you from that bed. If there are no wild stallions at hand, there’s always the temptation of The Juice Bar where you can sit and quench your thirst or the enticing hydrotherapy pool downstairs. 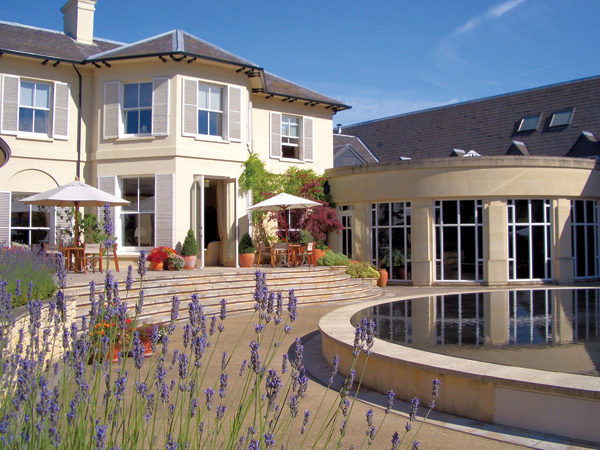 If massages aren’t your cup of Darjeeling, the Ellenborough Spa also offers signature treatments that include the summery-sounding Maritime Salt Body Exfoliation (£45) and decadent Sea Creation Facial Ritual (£115) along with various manicure/pedicure treatments that make use of the Leighton Denny range. 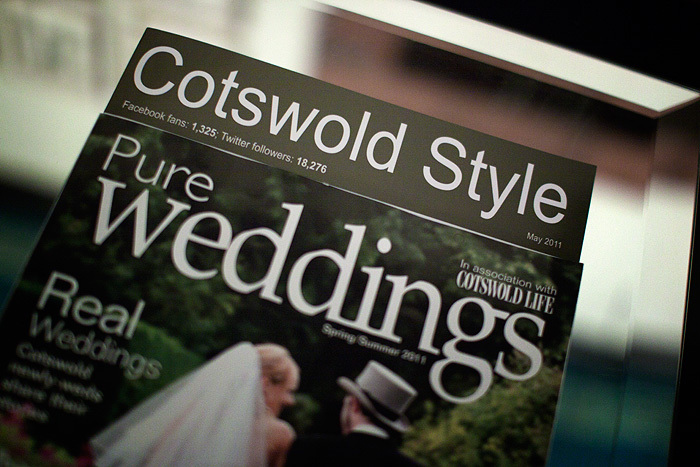 I’ll leave you with some more images from my visit to Ellenborough Park. 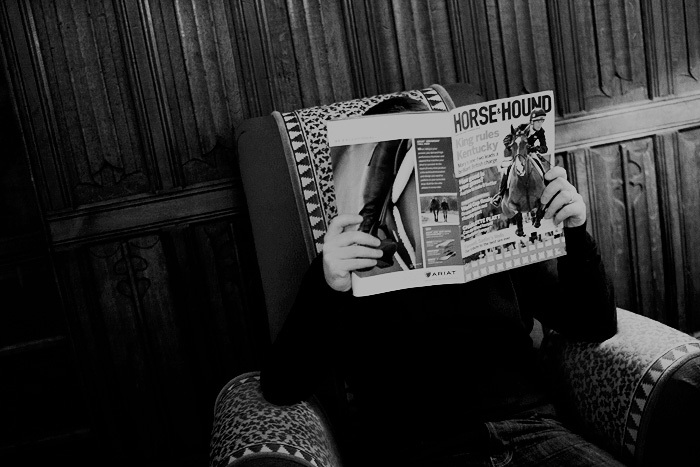 As you can see, I took advantage of the good weather to have a proper nosey around the Cheltenham hotel! I was fortunate to have the opportunity to enjoy their hospitality so soon after the 18-month restoration which has revealed a luxury country retreat that achieves an admirable balance between the traditional and the modern, the formal and the informal… business, pleasure and everything inbetween. 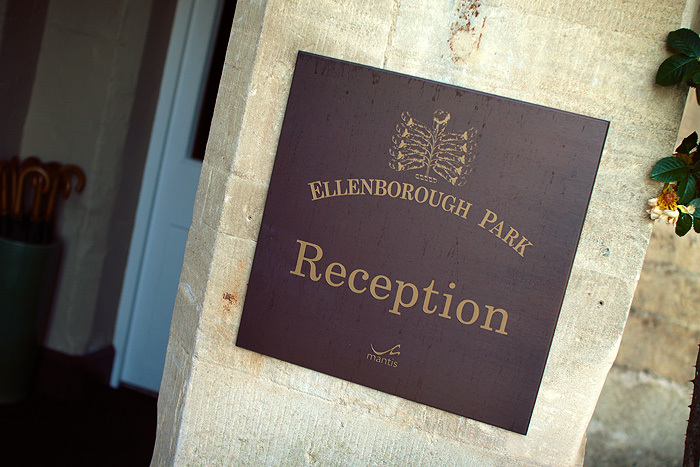 Disclosure: I was invited to experience Ellenborough Spa as a guest of the hotel and the treatment reviewed was complimentary. I have been looking forward to this for months! 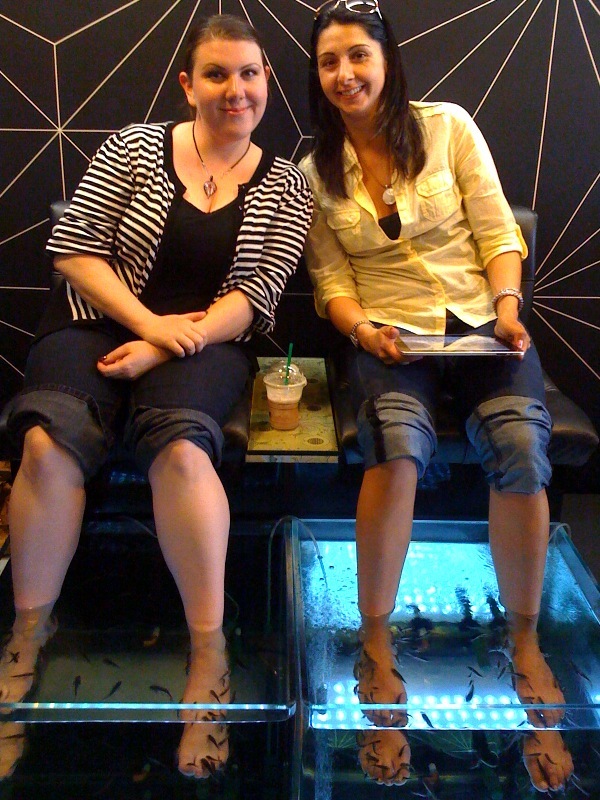 I booked my fish pedicure from Wahanda because they were offering a great mobdeal on a 25 minute pedicure. Infact, I booked 2… one for myself and one for my husband who instantly announced that he’d rather sit through a game of cricket than go for a fish pedicure. I took that as a hint and invited my cousin to come with me instead. The night before I made sure to exfoliate my feet with a sugar scrub in preparation… I didn’t want those little suckers to get an easy ride! 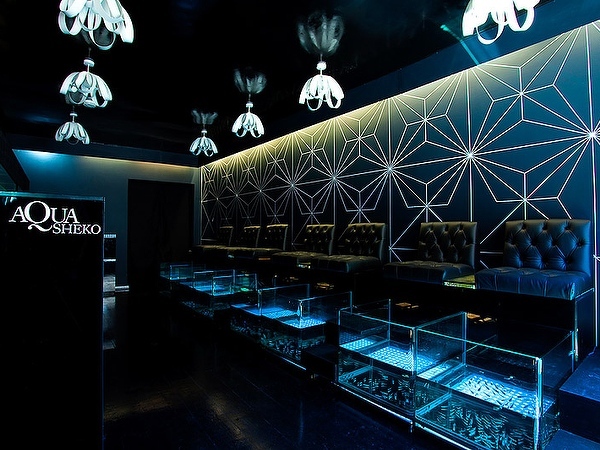 Aqua Sheko is fairly easy to find, just off Kensington Church St in London. The interior didn’t seem quite as plush and swanky as the website photos would have you believe. It’s quite a cramped and utilitarian space… and the decor just kept making me think of the Tron Light Cycle scene! Once my feet were clean and dried, the therapist carefully inspected them for cuts and sores. I had two insect bites on my ankle which were covered with a plaster before I was shown to the tank. I was brave. I didn’t even flinch! I did giggle though. Lots. What I didn’t realise was that you’re supposed to put both feet in the tank together at the same time… it makes sense right? Idiot. I plunged one foot in and they all rushed to greet it! Realising the error of my ways sharpish, it wasn’t long before I had both feet dangling into the water. It tickles. It feels like a jacuzzi but with a bit of gentle suction in places – especially if you get a couple of big ‘uns in your tank! It’s not unbearable… but if you are VERY ticklish, you may not enjoy it. Me? I kinda loved it… I giggled A LOT and made little to no verbal sense. I found it an uplifting experience and became quite fond of my little tank dwellers by the end of the session! My cousin? Not so much… she’s very pleased that she did it and wants to take a friend back as a birthday treat, but it’s more for the unusual experience than any therapeutic benefit. It was just too ticklish for her – she said she probably wouldn’t do it again. Not included in the Wahanda deal, we paid extra on the day to get a 15 minute foot massage after our 25 minute dip. It was a great way to finish off and having never had a foot massage before – I was amazed by just how good it made me feel! My therapist spent a few minutes working on my big toes (she said that she could feel I had stiffness in my neck!) and oddly enough a few days earlier, I had woken up with a terrible crick in my neck! It was only when we left the salon that we were able to really appreciate the benefits, both of us commenting that it felt as though we were walking on air. Post pedicure, my feet are much softer and smoother though I don’t think it’s as effective as a professionally-performed pedicure. 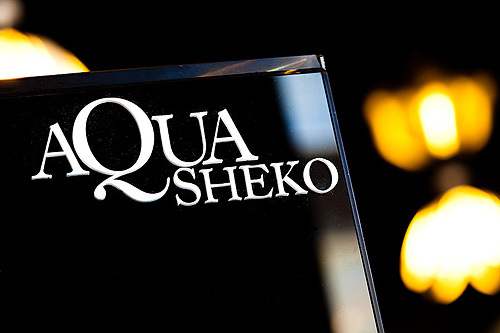 There’s a bizarre sense of camaraderie at Aqua Sheko. The staff are well-used to people who are reluctant to take the plunge (har har! ), they even keep an iPad on site to distract nervous fish botherers! Patrons were happily chatting amongst one another, keen to reassure any newcomers that it wasn’t as scary as it may seem. Would I do it again though? You bet! What a fun way to spend an hour. It’s a terrible video… but I’m no You Tube Guru and it’s the best I’ve got – sorry! 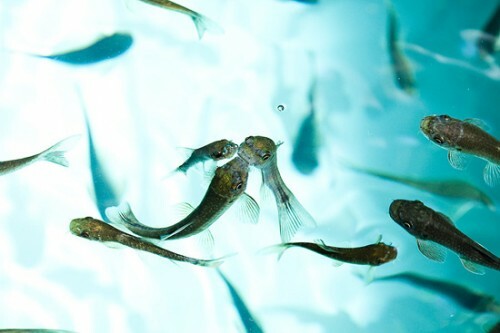 Here fishy fishy from lipglossiping on Vimeo. Four Candles… Handles for Forks! If you know what the heck that title refers to, you get extra marshmallows on your hot chocolate. If not, move along please… nothing to see here! Candles are something that often get ‘lumped in’ with the beauty category… is it because they’re considered a bit of a pampering indulgence? Buying an expensive candle is a bit like striking a match and setting fire to a couple of £20 notes after all… no? With the rampaging toddler, I don’t get the opportunity to burn as many candles as I’d like. I have my Annick Goutal treasure that I stroke lovingly and sniff wistfully, but if anyone were to put flame to wick, I’d do them some serious damage. 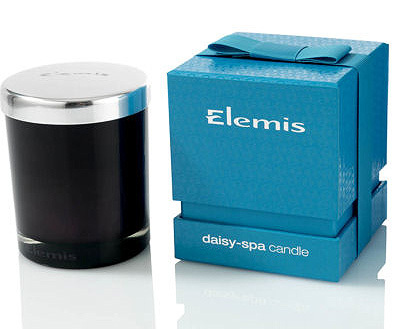 Elemis, Daisy-Spa Candle (£25) – Daisy, Banana and Freesia. Good grief, I actually can’t think of a more enticing combination right now. Fresh and energising but with that fruity, tropical hit from the banana. Yum! Available to buy online from TimeToSpa here. Malin + Goetz, Neroli Scented Candle (£29) – I adore the spicy, bitter notes of Neroli… it’s far more complex than just plain citrus. Neroli is one of the greatest scents for relaxation, this looks like a prime candidate for the bathroom! 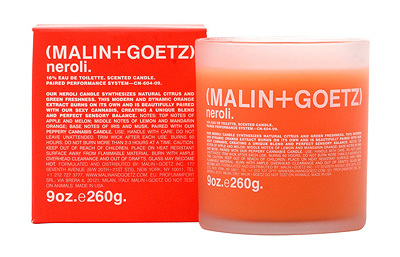 Malin + Goetz candles can be purchased online at Liberty. 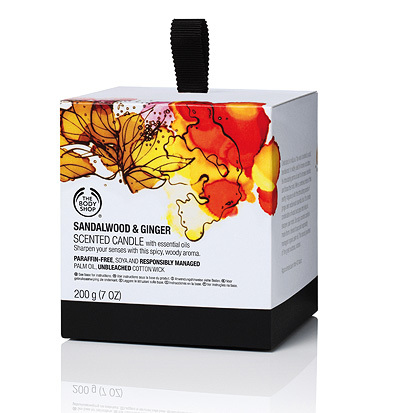 The Body Shop, Sandalwood & Ginger Scented Candle (£10) – Mmmmm Ginger… Are you noticing a recurring theme here? 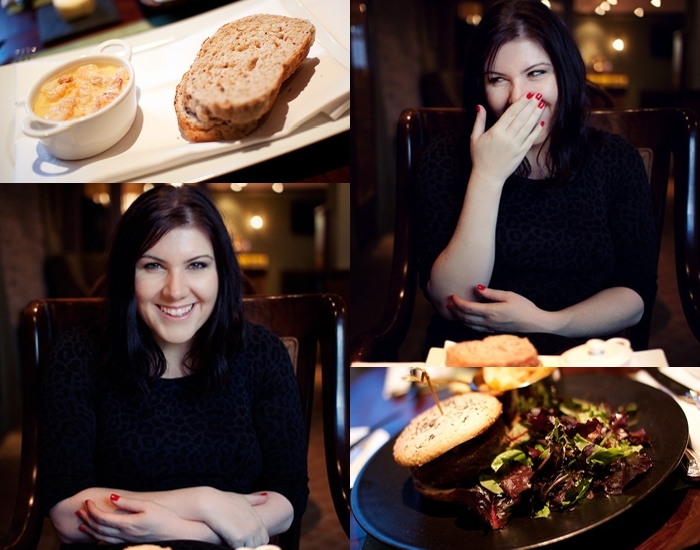 I have a bit of a thing for foodie smells! Bananas, Oranges… Ginger. Sandalwood seems to smell different to me depending on the product, it’s quite variable… but the warm smell of ginger is an eternal favourite of mine. Competitively priced at only £10, The Body Shop have a new selection of boxed candles to tempt you. 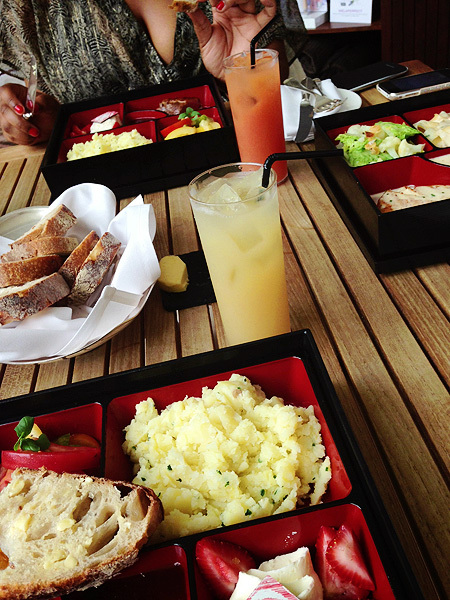 The Green Tea & Lemon one also sounds like a winner! 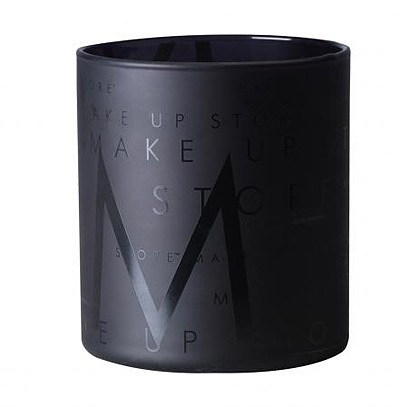 The Make Up Store, Your Valentine Scented Candle (£35) – Having had a good old sniff of the candles on display at The Make Up Store’s Carnaby Street shopfront, I can confirm that most of the scents are indeed, delicious! A little pricey though at £35 each. Your Valentine offers intoxicating notes such as Bergamot, Cyclamen, Vanilla and Praline… I’ve got the munchies again! Available instore only. What do you think of such frivolities? Do you have any favourite candles that you return to time and time again? Remember this post? I hinted at today’s Wahanda Mob Deal. How cool (and completely freaky) is this? 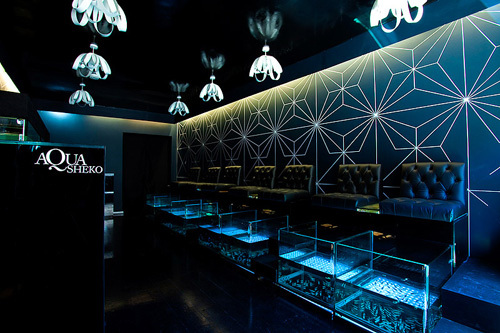 Aqua Sheko are offering a 30 minute fish pedicure treatment for a pretty amazing price of £12. Saving 60% off the usual price of £30. I’m in London and away from home today and tonight, but if I can get my iPhone working on the Wahanda site, I’m totally in! 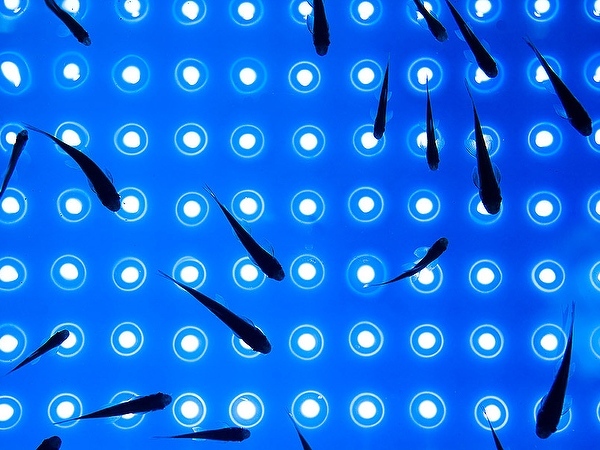 The Garra Rufa, a native Turkish fish are also known as doctor fish, the tiny toothless carp thrive in warm water and live off anything available – including dead, flaking skin. I’m having an “OMG that’s gross but I wanna try it anyway” moment. I’m guessing that if you’re REALLY ticklish, you may want to give this one a miss… but I kinda like it *blush*. Mr. L hates anything touching his feet, so I think I’d be going on my own… which doesn’t sound half as much fun – spoilsport! Anyone else up for a nibble? I mean bite? I mean… um…. anyone else fancy it? Incase you live under a rock and haven’t heard about Wahanda‘s mob deals, listen up! Every night at midnight, when the clock rolls over to a fresh new day… something exciting happens at Wahanda HQ. The elves get busy and the mailing list fires up, shooting news of a new Wahanda Mob Deal directly to your inbox. In a nutshell, it’s a pretty nifty health/beauty related deal at a crazily discounted price. In April, I paid £2 for £20 worth of Spa and Beauty Treatments at HQhair and Beautystore, which enabled me to get a £45 haircut for the grand sum of £27! As if that wasn’t good enough… I’ve just snapped up another Mob Deal, paying £20 for a Haircut & Blow Dry, plus Hair Treatment & a glass of wine at Lisa Shepherd. Value? £88. That’s a saving of 77%. OMG! 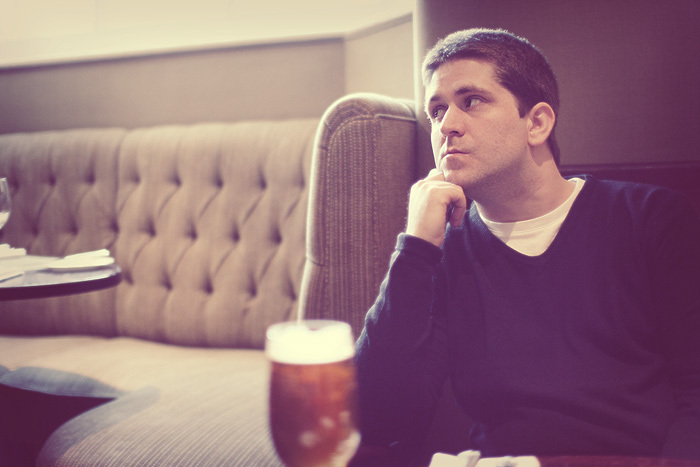 I wanna alert you to a new Mob Deal going up on Thursday that has been very much the talk of the town in recent months. 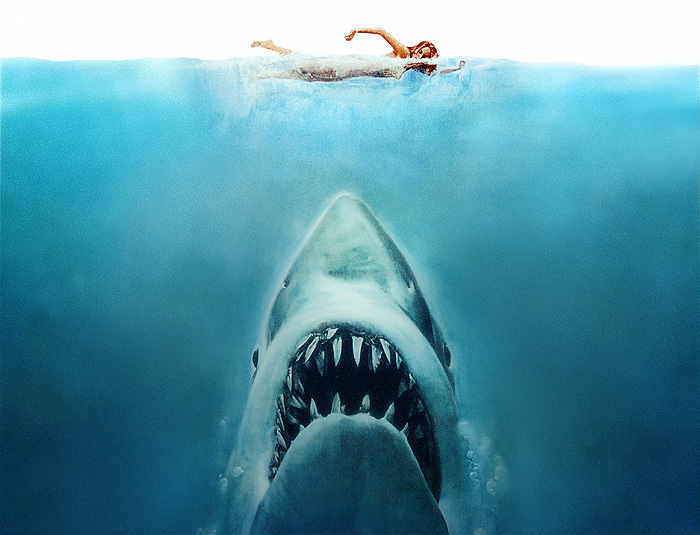 I don’t want to spoil the surprise too much, but let’s just say… “You’re gonna need a bigger boat”. I get £5 off any purchases I make on their site if you buy anything after signing up through that link. To make this a bit fairer though… please feel free to post your own personal Wahanda invite link in the comment below and we can all keep our fingers crossed that we get some extra money off what are some fab pampering deals!